Anyway, school has started for me and as usual, it's a bore. BUT my friend, Sya, and I decided to spice things up a little by having a dress-up day every Wednesday (NO ONE, NOT A SINGLE SOUL in my faculty dresses up.)! Last Wednesday, we had to wear dresses (Okay, I do have a couple of dresses lying DEEP inside my cupboard, but they aren't really my thing. I'm usually in my American Eagles tees and denim Espirit shorts.)! Click on the photos to get close-ups! Say 'Hi!' to Sya! 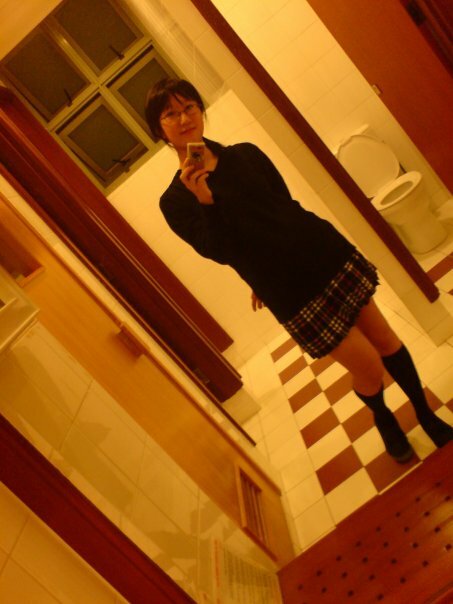 :D And also a big hello to one of the many loos in my school! And yes, I'm usually in spects because when I wear my contacts, my head seems to be ten times bigger. HAHA. I know it's completely irrational but yeah... Haha. This is a photo of me a couple of years back. Yes, I was in my estate's loo (Gorgeously huge mirror!). And yes, I completely love checkered skirts and knee-length socks! On Thursday, I woke up to a cold morning so I was like "Hey! I can wear my tights and boots!". But by the time I was done showering, the sun was high up in the sky, mocking at me. I wore my tights anyway, skipping the boots. One of my friend said I looked like one of the Spice Girls. AHAHAHAHAHA. I hope it's Posh Spice. She was my favourite! Anyway, I LOVE the tights so so SO much! And here's another picture! Haha. Okay, yes. Obsessed with tights. Those shoes are usually what I wear if I'm dressing up and am not in boots. Comfort takes priority over fashion. Trust me, I wish I could wear those ridiculously high heels and boots. But the thought of having to endure any sort of discomfort, getting painful and ugly blisters and of me tripping and fracturing any of my body parts (High probability here. I trip even on flat ground.)... Nuh uh! Alrighty. I now have to go battle monsters in the form of numbers.